Get ready to tackle the cold weather. Introducing the Waterproof Heated Gloves! The Waterproof Heated Gloves are the perfect accessory for anyone who enjoys outdoor sports such as skiing, snowboarding, and sledding, motorcycle or bike riders, those people who work outdoors, as well as anyone who is suffering from the cold winter. The Waterproof Heated Gloves are the ultimate winter gloves, ready to tackle any winter condition or cold-weather activity you can conjure up! The gloves not only protects your hands from snow and ice, but actually heats them to the tips of your fingers, for long-lasting warmth and comfort. 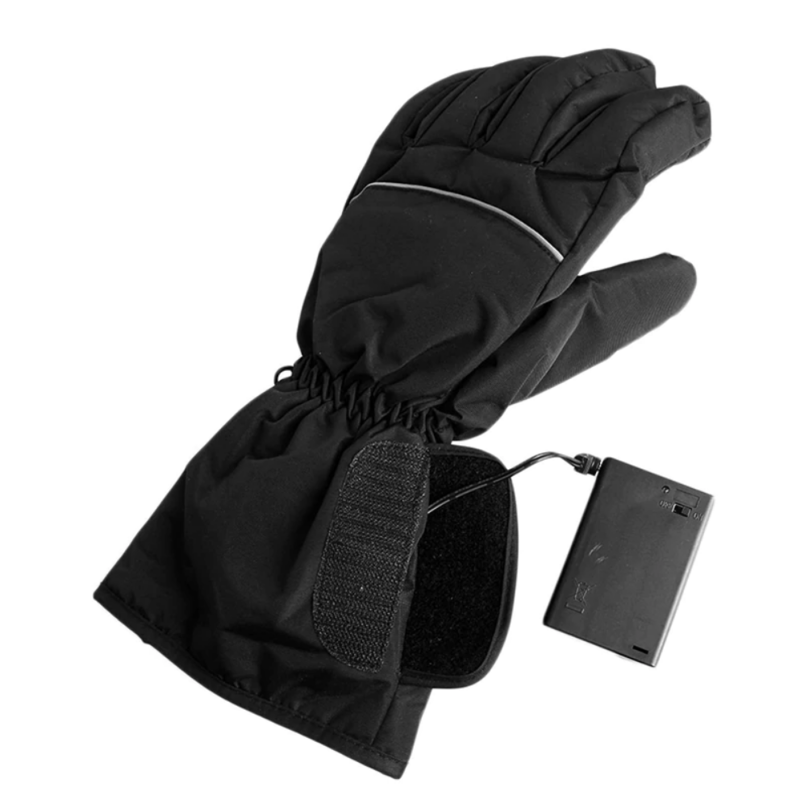 Electronically heated winter gloves, perfect for any cold weather activities. Carbon fiber heating element, optimally placed in the hand for a quick warm-up and even distribution of heat across the hand and fingers. Breathable membrane built in that protects hands from harsh conditions. KEEP YOUR HANDS WARM FOR HOURS! The Waterproof Heated Gloves are built with an innovative design & weather resistant construction to provide a long-lasting, warm and comfortable experience. The gloves can last up to 8 hours of warmth.The Waterproof Heated Gloves provide finger and thumb heating elements and feature Warming Textile Heated Insulation for maximum heat retention. These gloves keep your hands warm no matter how severe the weather is. Great for skiing, hiking, hunting, biking, shoveling snow and other activities in the cold weather. These gloves allow you to forget about the cold and let you focus more on enjoying your time outdoors. These gloves are FANTASTIC! 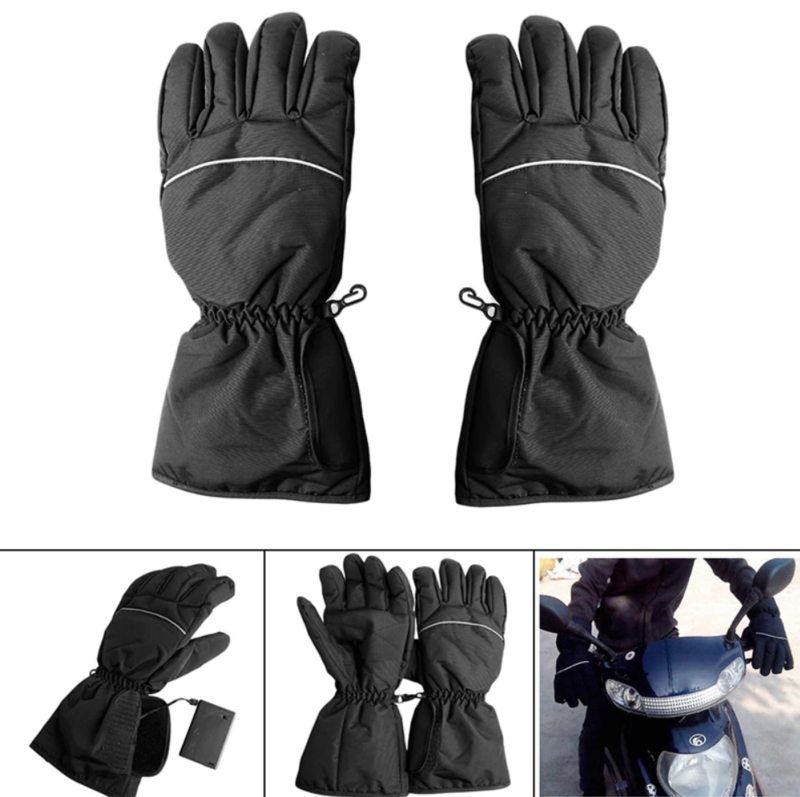 I use them on my motorcycle and they keep my whole hands, including my fingers, warm as toast. They are also flexible enough to easily work all the hand controls, and have a great feel to them. I also have these gloves. I can not find a pair that keep my hands warm, it doesn't matter how much they cost or the brand. Everyone else in our house wants to use them too. I have waited 67 years for a pair of gloves that will actually keep my hands warm while shoveling snow. Now I have one!! On my first use of them they paid for themselves. They work excellently, I would highly recommend them as an item worthy of purchase. Thanks guys, you did GOOD!!! These gloves are amazing! Everyone should get a pair! At the top of your hand rather than the palm, but your fingertips do get heated up as well. I went snowboarding last weekend with these gloves and the batteries lasted all day and my hands never got cold. I�d recommend turning on the glove when you need to. If your hands are not cold then don�t waist the battery life. These gloves work even with out the batteries. These gloves work really well, even to your fingers and thumbs. I bought them for my cycling commute (about 50 minutes each way) central Ohio. So far I have had four days that warranted these gloves 29F, 33F, 27F and one at 22F (some days with 15mph wind) and they worked great! I am a female with frequently cold hands and I used to use mittens with chemical warmers for cold days, especially mornings. The combination kept my hands warm, but were awkward for shifting and braking. These gloves are a game changer with excellent dexterity and grip, more even heat and rechargeable. These are perfect for cycling. For my rides, I set the level on the highest setting and my fingers were toasty.